The most vocal critic of Islam in German, is now the number one bestselling non-fiction author in the country. In less than two weeks, his book has sold over 100 000 copies . The book, entitled Hostile Takeover: How Islam Impedes Progress and Threatens Society, by author Thilo Sarrazin, is even on leftwing Der Spiegel‘s bestseller list for non-fiction. It ranked number one on Germany’s Amazon’s bestseller list before even going to print and the book has since been overwhelmingly positively received with 78 percent of reviews giving the book five stars. German mainstream media has tried to vilify the author’s work, claiming it not to be entirely factual, or having taken facts out of context. They rejected the idea that Islam threateneds the development of Germany due to what he says is its intolerance. SPD politician Heinz Buschkowsky, however, described one of the main theses of the book as being the higher on average birthrate of Muslims in Germany. Buschkowsky described Sarrazin’s proposal to reform the asylum laws in which he recommends asylum seekers be kept in transfer zones and that a decision on their claim should come no later than 30 days after their application saying the current asylum law had “degenerated into a gateway to illegal migration”. In 2010, Sarrazin published the bestseller Germany Is Doing Away With Itself, arguing that the “right sort” of German women were having too few babies and that the “wrong sort” (which he defines as Muslims and those with little education) were having too many. As a result, the German population was not only shrinking but getting dumber. The German weekly Der Spiegel referred to him then as “the man who divided Germany”. Critics claim that Sarrazin could further embolden the conservatives and “neo-Nazi violence”. 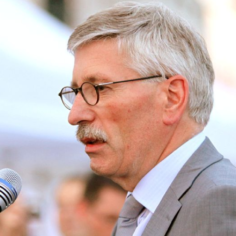 The former member of the Berlin city government and of the Bundesbank’s board, Sarrazin warned at the book launch in Berlin that Islam was not a religion of peace “but a violent ideology cloaked as a religion”.